San Diego World Affairs Council - "Why Mexico's Election, NAFTA and U.S.-Mexico Relations Are Important to You." "Why Mexico's Election, NAFTA and U.S.-Mexico Relations Are Important to You." U.S.-Mexico relations seem to be nearing an inflection point. Mexico’s national elections will take place July 1. Nationalist Andrés Manuel López Obrador (known as AMLO) – seen by some as Mexico’s answer to President Donald Trump -- is running far ahead in opinion polls. A sweeping win by AMLO’s left-wing, populist party, Morena, could mean implementation of policies feared by foreign investors and inimical to traditional U.S. positions. Mexico has responded to President Trump’s recent decision to impose metal tariffs with retaliatory tariffs of its own. The Mexican government expressed disappointment with the U.S. tariff decision but reiterated its commitment to achieving a successful modernization of NAFTA. Many Mexican observers, however, see the tariff battle as placing the already difficult NAFTA negotiations in serious peril. · Will trade relations between the U.S. and Mexico break down? · Could that lead to an economic crisis in Mexico and/or a U.S. recession? · Will diplomatic relations unravel further if AMLO is elected and reacts more strenuously to President Trump’s pronouncements about Mexico? · What will happen to bilateral cooperation against drug trafficking and gang violence? Ambassador Earl Anthony Wayne, one of the most respected U.S. experts on Mexico, will help provide answers to some of these troubling questions. Earl Anthony Wayne served as an American diplomat from 1975 to 2015. The U.S. Senate confirmed him as a Career Ambassadorin 2010. He is currently a Public Policy Fellow at the Woodrow Wilson International Center for Scholars and a Senior Non-Resident Advisor at the Center for Security and International Studies and at the Atlantic Council. Wayne is an advisor for HSBC Bank in Latin America on countering illicit finance. In addition, Wayne was elected Treasurer of the American Foreign Service Association. He served as the U.S. 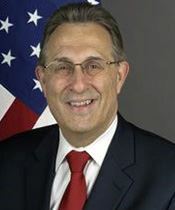 Ambassador to Mexico (2011-2015), Deputy U.S. Ambassador and Coordinating Director for Development and Economic Affairs in Afghanistan (2009-2011), and U.S. Ambassador to Argentina (2006-2009). Prior, he headed various high level positions in Europe and Canada. He is the recipient of numerous awards, most recently the 2017 Director General’s Cup for the Foreign Service and the 2015 Cobb Award for Initiative and Success in Trade Development. Wayne has an MPA from the JFK School of Government, Harvard University, an MA from Princeton University, an MA from Stanford University, and a BA from the University of California, Berkeley.